Muslim women and their allies organized protests in two Danish cities on Wednesday, as a ban on wearing face veils in public took effect in Denmark. 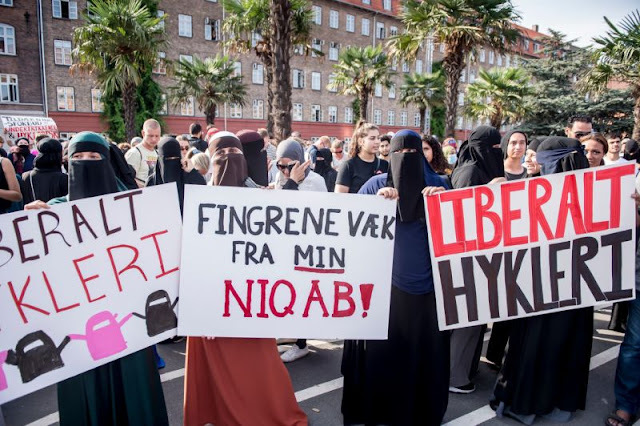 Protesters gathered in the capital city of Copenhagen and Aarhus, Denmark’s second-largest city, to condemn the government for a law they claim infringes on women’s rights to freedom of expression and religion. Some of the hundreds of Muslim and non-Muslim Danes who attended the Copenhagen protests flouted the new ban by wearing the niqab, an Islamic face veil that leaves the eye area open, Reuters reported. Others wore the body-length burqa, which covers the eyes with a mesh screen. Muslim women who do not wear face veils also participated in the protests. Danish police told Reuters that people who wear face veils during a peaceful protest are exempt from the ban. As a result, they said none of Wednesday’s protesters will be punished for veiling as part of the protest. The Copenhagen protesters marched from Norrebro, a neighborhood with a strong immigrant population, to the Bellahoj police station, which lies on the outskirts of the city. Starting on Wednesday, first-time offenders of the Danish ban on face veils in public risk a fine of 1,000 kroner (around $150). Repeated offenses could lead to fines of up to 10,000 kroner (around $1,500) plus a jail sentence of up to six months. The ban also prohibits balaclavas, false beards and other masks that obscure the face, according to Amnesty International. It doesn’t apply to headscarves, turbans or the kippah, the Jewish skullcap. Face coverings worn for a “recognizable purpose,” such as during cold weather or motorcycle rides, are also exempt. The law allows police to tell women to remove their face veils or leave public areas. Denmark’s justice minister Soren Pape Poulsen has said that police officers who see women with face veils on the street will most likely fine them and tell them to go home. Denmark’s center-right government passed the ban in May, joining countries like France, Austria and Belgium that have also placed restrictions on wearing Islamic face veils in public. The Danish government claims the law is not aimed at any specific religion and is instead intended to uphold secular and democratic values. Still, protesters believe the ban targets conservative Muslim women who wear niqabs and burqas. Danes who approved of the ban also rallied in Copenhagen on Wednesday. Supporters claim the ban helps Muslim immigrants integrate into Danish society. Human rights advocates have decried the law, claiming such a blanket ban is neither necessary nor proportionate. Research indicates only about 150 - 200 Muslim women in Denmark choose to wear the niqab or burqa. Muslims make up about 5 percent of Denmark’s population. 0 Response to "Danish Muslim Women Protest As Ban On Face Veils Enters Full Force"